“We put together an amazing show that is going to be filled with hits and fabulous memories, we know it will be hands down this summer’s best night out,” said Boy George. After more than two decades and 150 million singles &amp; records sold globally, 2018 marks a new era for Boy George and Culture Club, as they are currently working on their first new music in 20 years. 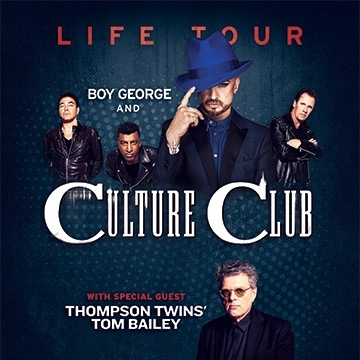 Thompson Twins’ Tom Bailey - For nearly three decades fans of the Thompson Twins have been waiting for more live performances from one of the most iconic bands of the eighties. Now The Thompson Twins’ Tom Bailey, with a new band, will be touring and performing the Thompson Twins hits. His all-female band feature Charlotte Raven on vocals and keyboards, Amanda Kramer (The Psychedelic Furs/Information Society) on vocals and keyboards and Paulina Szczepaniak on electronic drums. Much to TT fans delight, Bailey began writing contemporary songs again in 2016 and will be releasing a new album in 2018.